A new device can determine whether bacteria are present in a wound, according to a Bioengineering Today report, which cited a study published in the Journal of Wound Care. The MolecuLight i:X uses fluorescence to illuminate bacteria. When the device is placed over a wound, the image on its screen will light up in red to reveal the bacteria. Researchers used the device to examine 60 lower limb chronic wounds. 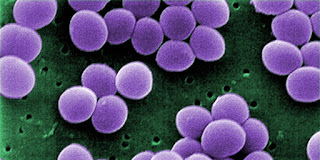 They detected nine common pathogens found in chronic wounds, including Staphylococcus aureus. In the study's abstract, the researchers note the following: "Fluorescence imaging of wounds offers clinicians real-time information on a wound's bacterial burden, insight which can influence treatment decisions at the point-of care." View the study here (subscription or purchase required to access full text).